I feel so free to create right now! I'm officially on spring break from the art teaching gig and all of my classroom cares have washed away. Now, I can focus more time and attention on the good stuff; quilty fabric goodness! My first project finish went into the hands of the post office today and will hopefully reach my dear friend and her little girl by mid week. I spent the evening last night creating a little label for it. I haven't done any embroidery since college when I recreated a portion of Bayeux Tapestry for my Medieval Art History class. So I think I've found another area that could use some skill building. After an hour and half of pulling weeds in my front yard I rewarded myself by finishing up a couple of Springtime themed log cabin blocks for the WERQ quilting bee that I joined in February. So far in this "Consortium of Men Who Enjoy Rigorous Quilting," we've made a block that feels similar to a Sudoku block, and now the log cabin. 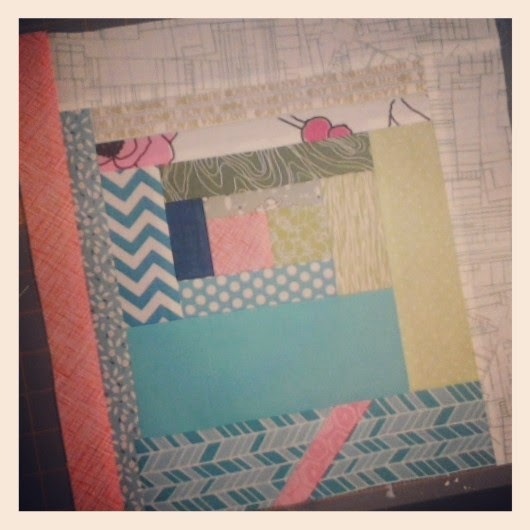 Sudoku-esque block; the first from the WERQ Bee. 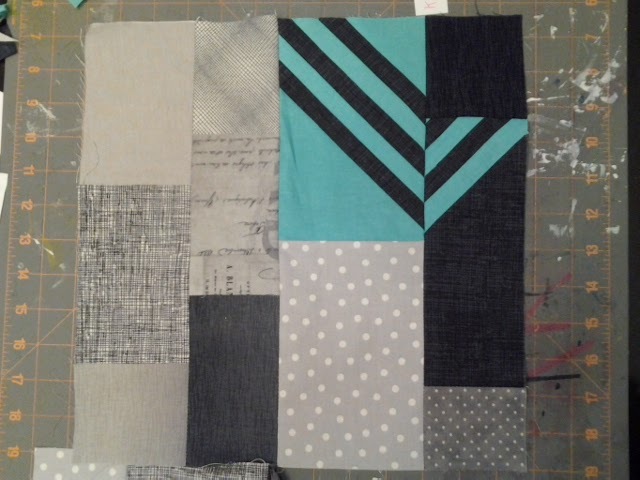 Each piece of the block was to have a different gray fabric and each participant was to incorporate the string pieced chevron in a different part that corresponded with the month that they host the bee. I know it sounds kind of complex, but the awesome February host put together some rockin' instructions that made it much less intimidating. I liked the freedom to improvise that was allowed and encouraged by the March host of the WERQ Bee. I added the fun diagonal stripe to one of my logs because I thought it needed one. In this Springtime inspired log cabin block I added a little tag. The thin pink stripe in the upper left quadrant sticks out kind of like the tag in a shirt. I like the idea, and I hope the host doesn't mind. 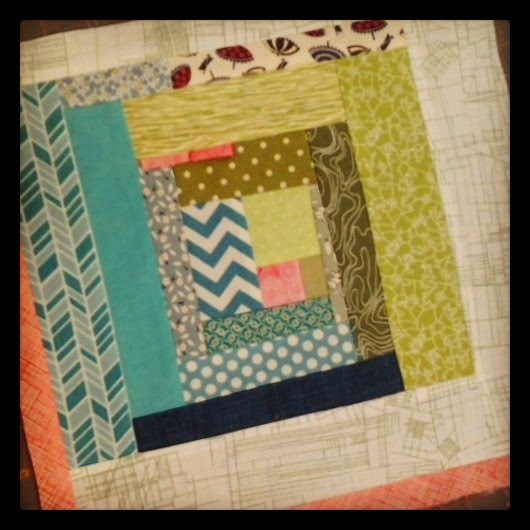 I was just thinking, it might be problematic when it comes time to quilt the finished top. Finally, I'm checking out some lovely new blogs thanks to the Anything Goes Monday linky party hosted by Marelize at Stitch by Stitch. The "tag" illusion you speak of...that is a cool little addition. 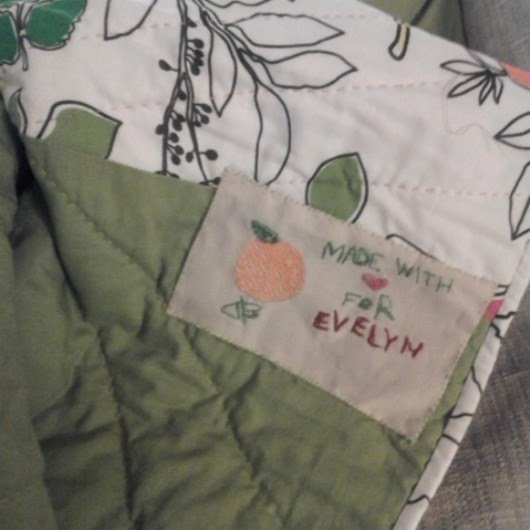 It made me think about a quilt I made from my grand daughter from her t-shirt fronts, t's that she loved and grew out of and meant something to her. JUSTICE was a clothing store she loved, so I used one of the shirts as that block and then cut the tag out of the shirt and sewed it with the seam of the block. I looks really cute and since the shirt didn't say JUSTICE on it, the tag does and is kind of pretty in itself. Which makes me think...many clothing tags are nice looking and could be a really cool effect attached to a quilt! That concept of sudoku quilt is interesting. It'a a good way to challenge oneself. Do you still have that piece of tapestry you recreated? I would love to see it! I went through your posts and I want to say that I love the colors of your red-pink-peach-white stars quilt (I'm sure it has a better name). I would love to see that too with your hand quilting. I'm a big fan of that method because as you said, it's very relaxing. France, I wish I did still have the embroidery that I did in college. It is no more due to an unfortunate Barni incident! I may attempt a recreation again, but I'd like to update the colors and perhaps depart from the original imagery and start to include my own. . .ooh I'm feeling inspired now!